2000AD comic Prog #789 (27th June 1992) | 'TAIN'T THE MEAT… IT'S THE HUMANITY! Prog #789 of 2000AD, the long-running British science-fiction anthology comic, featured this simple yet wonderfully evocative image of Button Man Harry Exton. Ex-hitman – or ‘Button Man’ – Exton (who bears an uncanny resemblance to actor Kenneth Branagh) is portrayed caught in the middle of a giant target from this Prog (issue) dated 27th June 1992. The cover was pencilled by Arthur Ranson, who also drew the strip inside, which was written by John Wagner, co-creator of Judge Dredd. Ranson’s artwork is simple yet incredibly effective. The concentric circles lead the reader into the image while the stark white background frames the image admirably. Ranson, who honed his realistic drawing style working on weekly TV comic Look-In in the late 1970’s, was the perfect choice for this gritty thriller and he really outdid himself here. The other strips inside the issue weren’t too shabby either. Prog #789 kicked off with part five of the epic Judge Dredd summer event Judgement Day. Kola Commandos came next followed by ABC Warriors: Khronicles of Khaos. Rogue Trooper followed, with Ron Smith (one of my favourite Dredd artists) on art chores, while Button Man rounded off a particularly strong issue. 2000AD purists may argue that Button Man had no real place in the comic as it wasn’t a science-fiction strip but I’m happy to turn a blind eye to that. Wagner’s writing on the story is lean and succinct and the story is told at a brisk pace, strengthened by Ranson’s realistic and richly detailed artwork. This first Button Man series proved popular enough with readers to spawn three sequels, two of which were drawn by Ranson. 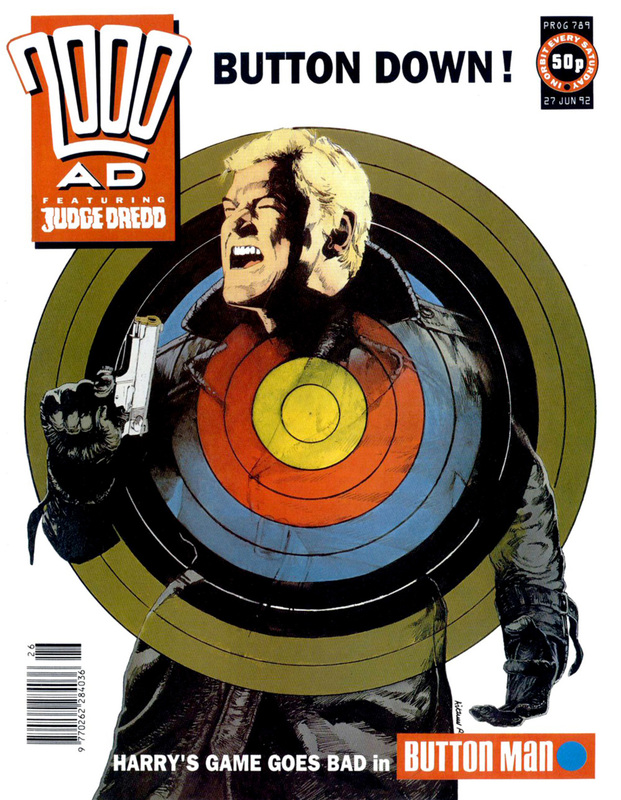 The series was also collected as a trade paperback that featured a reprint of the cover from this issue – hardly surprising with work of this calibre.